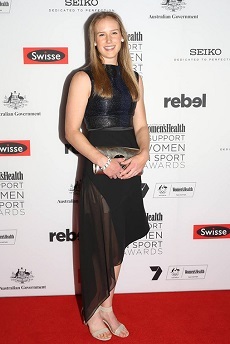 Southern Stars allrounder Ellyse Perry named “Outstanding Woman In Sport” for her achievments with bat and ball. Ellyse Perry has added yet another accolade to her growing list of achievements, receiving the ‘Outstanding Woman in Sport’ award in Sydney on Tuesday night. Ellyse, who was player of ther series when the Commonwealth Bank Southern Stars regained the Women’s Ashes from England earlier this year, was recognised for her achievements in both cricket and soccer at the annual ‘I Support Women In Sport’ awards. She was also nominated for the “Fair Fighter” award, while Southern Stars Meg Lanning earned a nomination for the ‘Leadership Legend’ award. The Southern Stars – who are the current world champions in both one-day and Twenty20 cricket and are the No.1 ranked team across all formats – were nominated for A-Team of the Year. Cricket Australia chief executive James Suthlerland James congratulated Ellyse on receiving the award, which was selected by Minister for Sport Sussan Ley. “It is great recognition of Ellyse’s dedication and commitment both on and off the field. It is also a credit to how she is always generous with her time encouraging young athletes and girls around the country to grow their skills and realise no dream is too big”. The ‘I Support Women In Sport’ awards are run by Women’s Health Magazine and are designed to celebrate the achievements of athletes from grassroots to the elite level.